I put Dad and Shannon's picture back in my pocket. 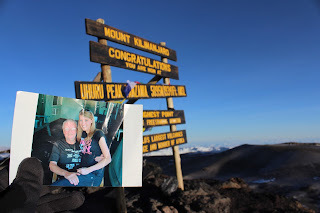 The tears dried on my cheeks, or froze, and then we took some pictures on the summit. We spent about 20-30 minutes on the top but then it was time to go. Spending too much time at a high altitude has the risk of making you very sick or even worse. Our spirits were high and we were feeling great so the descent down to basecamp was quick and exciting. Along the way we would stop to take pictures and chat with fellow hikers, giving words of encouragement to those on the ascent. I felt revitalized. We stopped at base camp for a quick bite to eat and about an hour or so of sleep. We had decided earlier on that we would make the full descent in one day. A cold beer and a bed to sleep in was too tempting to pass up. This all seemed like a great idea until about 20 km into the day after very little sleep. My legs started getting pretty rubbery but it was too late now. At about 3 in the afternoon we finally made it down to the trailhead. "Frankie, we made it, where's the beer?" "Just down the hill a bit"
Ryan and I looked down the hill about 100 meters to see a little shack. We looked at each other both thinking the same thing, "That seems so far away... but the beer is calling us"
On the way down, I was stopped by a couple of young local boys that tried to sell me a beer out of the stream. As much as I didn't want to walk anymore I had to pass on the luke warm river beer. We sat at a picnic table inside a small shelter from the sun. The beer, the seat, the feeling of what we just accomplished. It was all indescribably rewarding. The soreness we felt the next day was a bit easier to swallow because we had the rest of our vacation to look forward to. We spent the next two days between the hotel, the town of Moshi, and our guides home. Frankie invited us over to his home for Christmas dinner which ended up being a very memorable experience. We were introduced to his wonderful wife Lilian who prepared us a delicious Christmas dinner. Chicken, rice, potatoes, and salad, all of which was perfectly prepared on a hot plate on the floor of one of their two rooms. We also had the privilege to meet their beautiful young daughter, Dores. Frankie had let us know earlier that she was excited for the holiday and had asked for a bicycle. This gave us a great opportunity to make a sweet little girls Christmas very special. She was so excited and grateful for the gift as was the rest of the family and neighbours. They were so welcoming and happy to have us in their community. We felt like rock stars. After our Christmas break we headed out on a 5 day safari. So much beauty and peacefulness was great for the soul. We saw every animal we hoped to see along with many others I didn't even know existed. We spent two night in the Serengeti. The endless plains. It is a beautiful vast ocean of waving grass and rock islands. Following the safari we headed for the island of Zanzibar for New Years. It is a paradise. White sand beaches and the warm Indian Ocean made for an incredible New years. The setting was perfected by some wonderful people who we met up with to celebrate the culmination of 2015. These were a collaboration of fellow travellers we had met along our journey. All of them were seemingly like minded people but all here for their own reasons. A great part about travelling is meeting new people from all over the world. We had a very memorable time, but after a few days of 40 degree weather we were ready for our next chapter. We took the ferry to Dar As Salam and after two nights there we were off to Rwanda. After a bit of visa confusion and a night sleeping on a bench in a Nairobi airport coffee shop we landed in Kigali. This is no knock against the places I've visited in Africa or the residents, but litter is an issue. I understand that it is a very low priority issue in Africa but I felt like it should be mentioned because Kigali did not fit the stereotype at all. It was immaculate. Clean, manicured grass, shrubs and trees were on every corner and roundabout. There was not even a fluttering piece of loose paper to be seen. It was very impressive and even more so given the likely state of the Rwandan capital only 20 years prior. Knowing only portions of the recent atrocities that occurred in Rwanda we decided to learn as much as we could while we were here. We stayed at the Hotel des Mille Collines, which was home to over 1000 refugees attempting escape from the brutality of the genocides in the early 90's. Made famous by the film "Hotel Rwanda" it was a truly beautiful hotel. Our trip was full of great memories and moments I will never forget. Kigali will stick with me forever but not entirely as a great memory. We visited the Kigali Genocide Memorial, which contains facts, images, first hand accounts, and items, from the brutal 100 day period in 1994 where approximately 1 000 000 were murdered for superficial reasons that will never be understood. The images and stories will be with me forever. My eyes are right now filling with tears as I recount the stories from the section "The Children's Room". This blog has been very raw at times and quite emotional, but I won't get into further details of this experience. I would encourage you all to delve into this recent event. Not to understand it, but to see how we can often fail each other, and maybe learn how we can avoid any such atrocities in the future. Behaviour like this is still very apparent in other parts of Africa and the rest of the world. Next on our list was Uganda. Yeah, I know. Great segue, Dan. We had met a friend on Kili, at our hotel, and then again on Zanzibar, who was volunteering his doctor skills at a hospital in the small town of Kisoro in Uganda. We stayed with him for 3 nights as we toured the area including a trip to see the famous silver back gorillas in their natural habitat. This was one of the entire trips highlights. We hiked up a mountain on the outskirts of the town where we encountered a family of gorillas. We spent an hour within meters of these 400lb beautiful animals who share so many likenesses with us humans. They were very intimidating due to their amazing size and strength but showed no aggression towards us, even as they walked within feet of where we stood. After Kisoro we followed a recommendation from our friend and headed for Lake Bunyonyi, where we spent our next 2 nights. A quiet lake with many bays and calm waters, made for some great days paddling around in the homemade dugout canoes. We encountered many people along our travels but a group of children we encountered on the lake may be the most memorable. There were about 20 small children in one dugout canoe along with an adult at either end. In unison they all said hello, asked us how we were and encouraged us to follow them to land where they would perform a song and dance for us. How could we say no? We reached land and we joined them for their performance. They were such amazingly happy children full of energy, you would never suspect the tribulations they had faced in their short lives. All orphaned children, they had lost their parents to AIDS. The adults informed us that 6 of the children also were HIV positive. You could not determine which children were facing the disease, especially given the huge smiles that all of them had on their faces. These children and this moment will always have impact on me, help keep me grounded and keep life in perspective. From Lake Bunyonyi we continued our journey through Uganda to it's capital of Kampala and then onto nearby Jinja, where we got to experience the power of the Nile first hand. We signed up for a day long white water rafting trip down the rapids of the longest river in the world. This was an intimidating feat as I have never done anything like it. We had a brief orientation and got ourselves situated in the raft. We started off with one of the biggest rapids of the day, which was a class 5 with a 4 meter drop. It was a great rush and set the pace for the rest of the day. The warm water, great people and the perfect setting made me into a huge fan of white water rafting and the Nile. Thanks again to Nalubale rafting and their amazing staff. The next was a short stop in Nairobi on the way back to the town of Moshi, where our journey would conclude. We went back to the Springlands hotel for a few nights, collected our gear, said our goodbyes and then headed back home. It was an adventure of a lifetime. 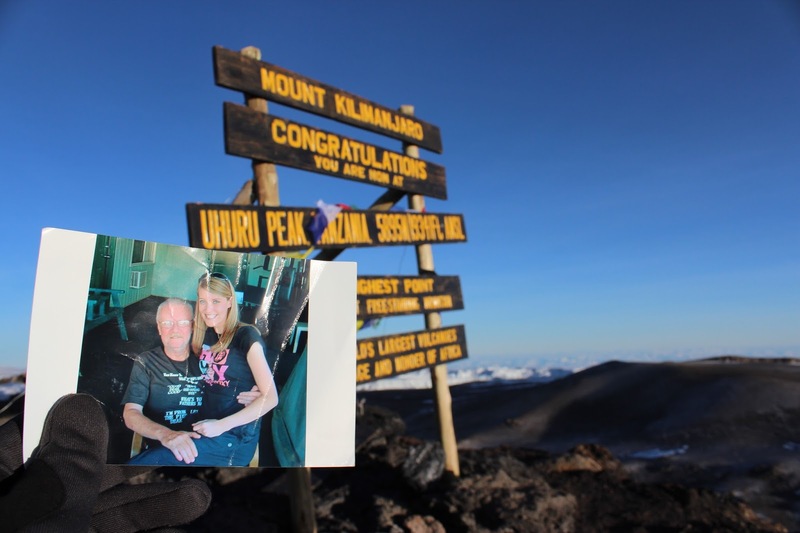 Thanks again to everyone who was a part of it, through encouraging messages, donations to our cause (we raised over $12 000 for the Alberta Cancer Foundation) and all the help and hospitality which we received in Africa. When I got back home I did some visiting with my friends and showed my thousands of pictures off as well. It was great to be back home, although winter was still upon us. After a week or two of being home I found myself falling back into a bit of a rut. The trip was over. A trip that had kept my mind very occupied and distracted for many months. And now it was over. Another chapter of my life over and I again had this feeling that I thought was behind me. No answers.... no real purpose. I sat there...almost stuck to the couch...for days...I thought of something Shannon had said to me while she was near her final days. "I know this is the end for me, but don't let this take both our lives." That's it. I have to get up. I packed up my truck and left for the west coast. A trip me and Shannon had done together a few summers back. So I was once again gone, unsure of my destination or what I was searching for. She wasn't riding shot gun this time but I could feel her with me, smiling. We boarded a plane leaving Canada, heading towards a world that I knew very little about. As I sat on the plane I questioned a lot of things that put me there in the first place. It was just a subtle conversation, had between Shannon and I, that is sending me to an unknown land to climb a mountain which I also have very little experience in. Was I hoping to find something? You would think that 20 hours on a plane would give me enough time to find some of the answers, but nerves and tight quarters made deep, rational thinking rather difficult. We landed in Amsterdam for a short layover. Ryan and I separated for a bit knowing that we would see a lot of each other over the next five weeks. I wandered around the airport people watching and wondering to myself about all the other stories each person had. What paths led all these people to be here? Are they here for business or pleasure? What am I doing here....? Just another 10 hour flight and I will be landing in Africa. The world seems so small. I was able to get an hour or two of sleep before touching down at the Kilimanjaro International Airport. The nerves I had been feeling became a bit amplified when I stepped onto the runway. What if they don't let me in? I felt like I had done as much as I could to prepare but nerves don't have to be rational. And they proved to be unheeded as within an hour we obtained visas and were in a van on the way to our hotel. It was past midnight by the time we got into our hotel room, so after some unpacking and repacking to get ready for the early morning hike we got into our mosquito netted beds and caught some rest. We awoke on time and got our things together to meet with our guide. I was excited and nervous, which seemed to be the theme of the trip for me thus far, but having someone with me like Ryan to either share in the nerves or push me past them was very appreciated. We met Frankie around 8 AM. Frankie Kizito would be our guide, interpreter, educator, motivator, personal trainer and friend over the next 8 days. My first impression of Frankie was great, as he was friendly, spoke english, and was very confident in our ability to make it to the top of the mountain. My impression of him only increased as I got to know him. After weighing our gear and a bit of organizing we loaded up the Land Cruiser and headed out. I say "we" loaded up the Land Cruiser, but in honesty the porters did all of the loading and unloading of everything. We had our day packs but that was pretty much all they would let us carry no matter how much we insisted. It was a long drive to the gates where we signed in and paid for park entrance fees, but it was full of beautiful scenery, things that were very new to me, and some pretty impressive driving maneuvers that you would not easily get away with in Canada. It's all part of the adventure. We arrived at the gate, snapped some pictures and enjoyed a box lunch before getting back in the truck and heading for the trail head. We passed huge potato fields full of people working in the heat, picking and bagging potatoes. With the heat blasting on them, their hands dirty, and having to carry massive amounts of weight they always managed to smile and wave. Everyone here seemed so happy. It's contagious. It's been hard not to smile here. At the trail head there was a massive group of people starting out on their adventure. I again wondered what everyone was doing here. Ah.... I got one... maybe not the main reason I did this, but at least I had something now. It's a cause that Shannon helped even before she got sick. A cause that is so close to me and many of you reading. Ryan and I set a goal that we felt was very ambitious, but all of the support we had, made short work of that goal. Looking at the trail head, with my day pack on and the large group, along with many of our porters, gone on ahead, I took my first steps on a trail that would lead me to somewhere or something that I felt I needed to be. That was the first thing that came to mind. Up and up and up were the next three. The rain started. Rain, up, rain, up, rain, up. Is this my whole trip? This is supposed to be enlightening and freeing. This is only an hour in, Dan. Be positive. Shannon would love to be here. Enjoy it. Sometimes I just need a quick reality check and she was always great to give it to me. Thanks Shannon. The rest of the day was amazing. Walking through a forest. Seeing new things at every turn. The rain let up and we settled down for our first night camping on Mount Kilimanjaro. The next morning we woke up and packed our things for the porters and packed our day packs for us to carry. It was a physical day but relatively short. We were up and down but it was a climb for the most part. We eventually ascended out of the trees and came into a much less vegetated and much more rocky area. We walked along a ridge that increased quite steadily until we were able to come down a few hundred metres to our next campsite. The first several days are mostly used to acclimatize your body to the elevation so that you hopefully won't have many problems when you attempt the summit. The slower start was welcome for me and definitely gave me some confidence for the remaining days. Frankie was continually encouraging and happy with our pace and progress. We got up early again the next day and packed our things. We were told to bring a few extra layers as it was going to get cold. We loaded our day packs and left as the porters packed up the remaining gear to lug up the mountain to set up for our next camp. The porters are quite amazing. Lugging so much weight on their heads and backs in nothing more than worn out running shoes, which were often without laces. Doing so with a smile on their face and always being polite is so commendable. We were so impressed with their insanely hard work. This hike led us up, and up again. I'm not sure what I was expecting. We weren't going to reach the summit by going down. We had left all vegetation a few hours in and were getting into some cold temperatures. We approached what was called Lava Tower. A huge rock formation that lived up to the name "Tower". It was a bit chilly here as the rain and mist swept in. It was also above 4000m in elevation and I could feel the tingling in my hands and face that is caused from being at high elevations. Here, under the Lava Tower, we stopped for some lunch and then descended along a different route to our camp. The descent was long but just like the rest of the trails it was full of awe and beauty. That evening we sat out in front of our tent and snapped pictures of the amazing scenery. It was clear so you could see the lights of Moshi and along with every star imaginable. I was concerned about the tingling in my hands and face. I thought of the man we saw passed out being helped by porters and guides. I started to wonder about not making it. I hadn't really thought about not making it. I started to be concerned about the disappointment I would feel, then I recalled what my mother and Shannon's mother, Brenda, had both said to me before I left. "Don't push yourself too hard. Just do as much as you can. Be safe. Love you." I had so much love and support from my family and friends. If I didn't make it no one would be disappointed. I was still doing something new and exciting. It's not the destination, it's the journey. There was no failure. Ahhh... another one. I'm here on an adventure. To get out of my own way. To see a world outside of my own. Take my mind off of things back home. Not to run away from anything, but to see a different world at a time when I find my world difficult. Seems like a good enough reason to be here. Not the whole reason I did this but I'll take it for now. Now forget about the tingling, Dan. Enjoy the stars. Enjoy the quiet. No time for worrying, you've got a mountain to climb. The next day we were heading up what they called the Baranco Wall. It appeared to be just that, a wall. Lucky for us there was a hiking trail to navigate us up this behemoth. We made good time getting through this large ascent and continued to descend and ascend several times until we reached our next camp. Here is where we, along with Frankie's encouragement, decided to continue our day and move along to the next camp. Frankie was continuously impressed with our progress and push each day and was confident we could cut a few days off of our trek. We talked about it and thought of the porters and cook and guides. Christmas was approaching and I didn't feel like spending christmas eve in a tent and I'm sure the crew would rather be home with their families. We were happy with our decision, but it meant a long few days. We reached the next camp around 4 in the afternoon. This was base camp. The porters set up camp, we ate supper and got a few hours of sleep before being woke at around midnight to eat and start our venture to the summit. This is where people often stop their trek. Combinations of altitude sickness, and steep gains over loose shale make the climb to Stella Point the hardest part of the hike. But I felt good. We started out around 1 AM and slowly plodded along. Frankie in the lead followed by Ryan, Me and our assistant guide followed closely behind. It is Swahili for slow, slower and it is very frequently heard from guides all along the trails. Slow ascents are key to avoiding altitude sickness and reaching the summit. The time also moved "Pole Pole" along this ascent. The cold wind, steepness, and altitude made for a difficult hike. Another one! Another reason to why I'm here on this mountain in Africa. To accomplish something that I may have doubted I could do. Thats why I'm doing this. To challenge myself. To push myself to newer limits. You can do this. You have so many people behind you. Helping you with every step. There's no stopping you. I won't lie. It was difficult, but it was also so very beautiful. The stars were lighting the way. The sun rose as we ascended from the steepest area to what is called Stella Point. From there the walk remained slow but much easier than the previous few kilometres. The steps became lighter and lighter as we came to the summit sign. I reached into my pocket and with tears in my eyes I pulled out a picture of my father together with my wife. All three of us smiling. They would be so proud of me. I gained a part of their adventurous souls and I used it to put me on top of a mountain on the other side of the world. I felt amazing. I was living my life. I left a lot of emotions and hurt on top of that mountain. Uhuru Peak. Swahili for freedom. Why was I here? Why did I do this? It was clear to me once I reached the summit. I did this for him. I did this for her.